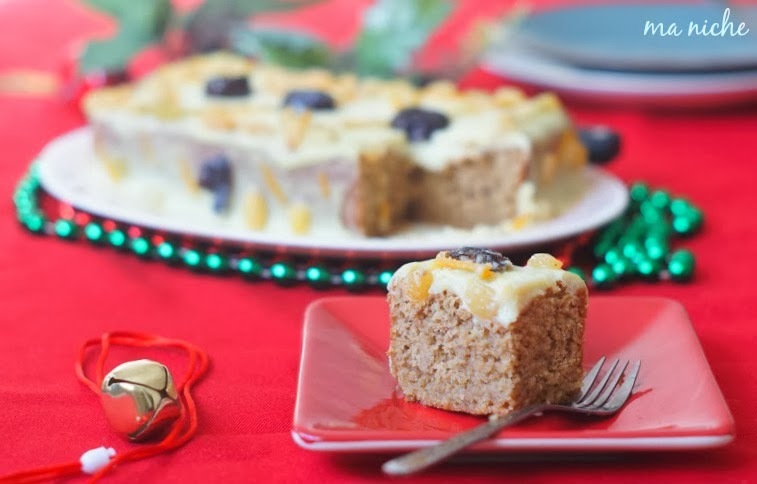 Besides the Yule Log Cakes, I also found this Nicaraguan Christmas Cake recipe that looked very appealing. So I included it in the list.. and decided to try this before I get started at the French Yule Log..
Pío V though called a Christmas Cake is really a gourmet dessert with a cake base and a custard topping that is typically served in Niacaragua during Christmas. It is made up of marquesote, sopa borracha, and manjar. 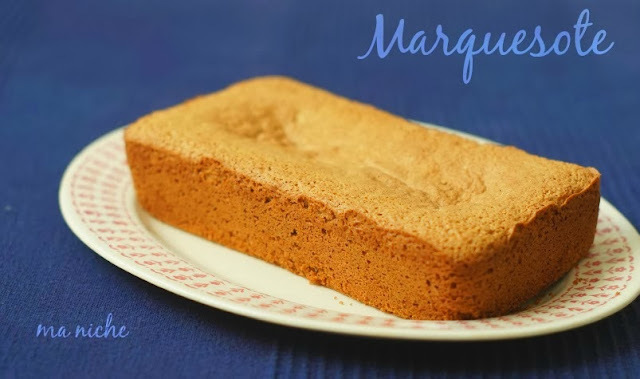 Translated literally marquesote means cake, sopa borracha means drunken soup referring to the a rum-laced syrup that the cake is soaked in and manjar means custard. Apparently, this dessert is named after the 16th century Pope Pius V, however there is no written evidence or verbal conjecture bearing proofs of it. Besides using yellow cornmeal, I deviated from the original recipe at two more points. Firstly, I boiled the rum with the other ingredients of the sopa borracha thereby boiling off most of the alcohol content of the soaking syrup. 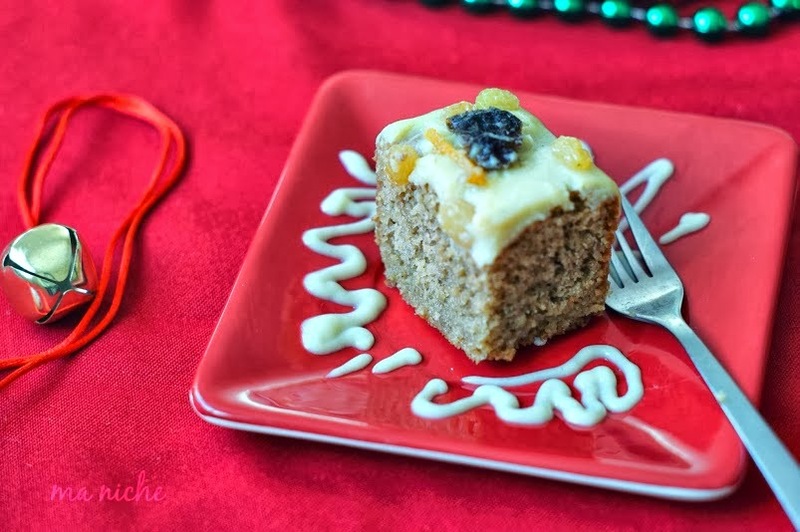 As a result my version of sopa borracha wasn't a "drunken soup," yet it rendered a lovely flavor to the cake. Secondly I used orange peel instead of lemon peel in the syrup and used slices of the peel to decorate the cake. I guess using orange peel instead of lemon might have effected the flavors but it still felt wonderful. The Manjar or the custard recipe was the only part of the dessert that I did not mess with. The Manjar seemed like a simplified version of crème anglaise and in future I'll probably be whipping this up more frequently than the cake. Overall I thought PÍO V was an easy and delicious whip with an exotic name ... and I'll shall come back to it the next time I have guests for dinner.. Position a rack to the center and preheat oven to 350° F.
Grease a 9 × 5 inch loaf pan generously and keep it aside. If using white cornmeal, toast it over medium high heat until it is golden and fragrant. I skipped this step since I was using the precooked yellow cornmeal. Sift the cornmeal together with the flour, baking powder, cocoa, cinnamon powder and set aside. In a large bowl beat the egg whites and salt on medium-low speed until the mixture gets frothy. Then increasing the speed to medium-high beat the eggs until soft peaks form. Gradually add the sugar at this point and continue beating until stiff glossy peaks are formed. The whole process takes about 10-12 minutes. Beat the egg yolks lightly and using a wooden spoon stir it into the egg whites. Add flour mixture to the eggs in three additions alternating with milk and scraping bottom and sides of the bowl. Finally, stir in the vanilla extract and scrape the batter into the prepared pan. Bake in preheated oven for 25-27 minutes until the cake comes out of the walls of the pan and a skewer inserted in the center comes out clean. Transfer the pan to the cooling racks and cool completely, about 1 to 2 hours. Meanwhile prepare the syrup and the custard. Bring water with all the listed ingredients to a boil. Then reducing the heat to simmer the mixture for 30 minutes. Strain the mixture, pluck out and discard the spices, keep the raisins, prunes and orange peel aside and let the syrup cool down to room temperature. Boil the milk along with the cinnamon sticks, pluck out and reserve the cinnamon sticks and keep the hot milk aside. In a separate heavy bottom saucepan, whisk the egg yolks along with the sugar, cornstarch and salt. Whisking vigorously, add 1/8 cup of the hot milk into the egg yolk mixture, then whisk in to remaining milk. Add the reserved cinnamon sticks into the mixture and whisking continuously, bring it (the mixture) to a boil over medium heat. Continue the process till the mixture attains the consistency of yogurt. Heat 2-3 minutes more. Then switching off the heat, stir in the butter and vanilla extract. Press a piece of plastic wrap on the surface of the custard and transfer to the refrigerator to chill for 2-3 hours. You can alternately chill the custard by placing the bowl in a ice bath and stirring continuously for 15 minutes or so. To assemble the dessert, poke the cake all over with a fork or skewer and spoon the sopa barracha syrup over it. Once the cake absorbs the syrup, pour the custard over the cake, smoothing it out the surface with a spatula. Top it with the soaked raisins, prunes and thin slices of the orange peel. Chill the cake for atleast an hour before serving. Before you leave hop over to Zesty South Indian Kitchen to check out what the other Baking Partners have baked this month. I shall be sharing this cake at the following food events and weekly parties..
Hi Tanusree. After seeing your cake, I'm sure I'll bake it. It looks delicious and it seems easy. Love it! Thats an very very different cake :) looks fantastic dear !! This looks yummy. & beautifully presented. Beautiful and super delicious looking cake!! Fasinating… I need to try this cake.. I can't quite image the flavor… really interesting. Thanks for sharing it on foodie friday. I love reading about and trying traditional holiday foods from other countries. This cake sounds fantastic. Thanks for sharing it with us at Saturday Dishes. love the custard on top of the cake and the decorations. 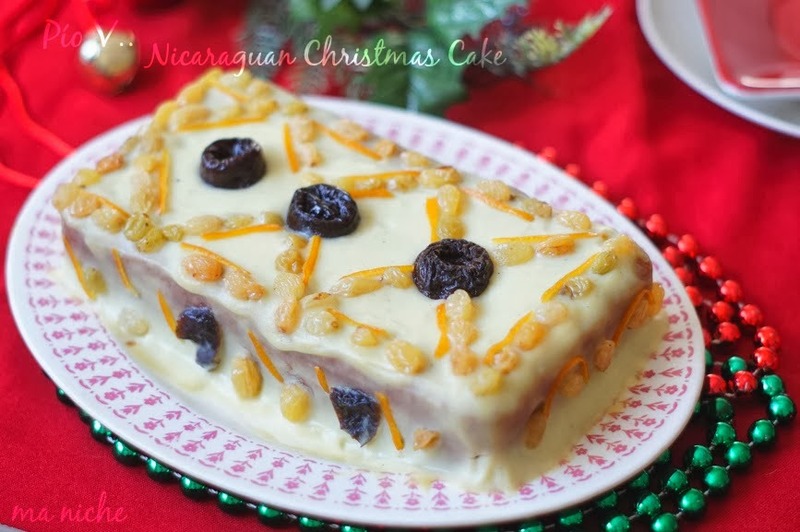 I was so interested to read about Nicaraguan Christmas Cake, Tanusree. I had never heard of it before but it sounds wonderful. I always love learning about new (to me) foods and their history. Your version of Pío V looks so pretty too. Thank you for sharing it with us at The Hearth and Soul Hop. Wishing you and your family a very Merry Christmas!